What's the spell for conjuring a massive TV to go with it? The boy who lived on DVD and Blu-ray will now be getting an Ultra HD makeover just in time for Christmas. The complete Harry Potter film collection is coming to 4K Blu-ray on November 27. So that's all eight main-line movies, (Harry Potter and the Sorcerer’s Stone, Chamber of Secrets, Prisoner of Azkaban, Goblet of Fire, Order of the Phoenix, Half-Blood Prince, and the Deathly Hallows – Part 1 and Part 2), freshly remastered to take advantage of the fancy new-ish format, complete with DTS:X audio. 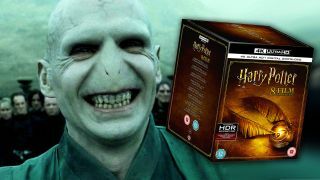 You can pre-order the 4K Harry Potter boxset now. If you don't have a 4K TV or player, but still want all that magical goodness beaming out of your HD TV, you can pick up the "Wizarding World 9-Film Collection" that includes the core films and the newer Fantastic Beasts and Where to Find them on regular ol' Blu-ray. It'll be followed by a new VR experience based on the Fantastic Beasts franchise. Coming to "several" VR platforms at an undisclosed date, it'll let you interact with a bunch of magical creatures in Newt Salamander's magic box. And, if you're not into boarding school kids recklessly playing with powers they barely comprehend (insert political joke here), then there's a massive selection of great UHD films in our best 4K Blu-ray movies list. Check it out.